Marj made an Underground Railroad quilt using flannel (brushed cotton) fabric. She talks about the meaning behind each of the blocks and the controversy over whether the story, of quilts signposting America slaves to safety in Canada, is authentic. Later she talks about the people she makes quilts for; her family and those who ‘need some comfort’, as well as to raise funds. Marj also explains how quilting has helped her to connect with people as she has lost her hearing. Joy Morgan [JM]: Marj, can you tell me a little bit about your quilt? Marj Abraham [MA]: Yes, it’s… I went with my husband to a quilt show in Llancaerfawr and the raffle quilt was the Underground Railroad Quilt and he loved it, absolutely fell for it, bought no end of raffle tickets and we came home, and all next day he said, ‘Am I going to have a phone call, am I going to have a phone call, have I won the quilt’. [JM: Right]. Well of course he didn’t win the quilt, so I made the quilt for him. It was the Eleanor Burns one, which I know there is a lot of controversy about, people don’t think it’s authentic. But for me I just love it and I love the story, and we had been through America, following the Civil War… [JM: Right.] and so a lot of it meant quite a lot to us. So I made it out of flannel… [JM: Right] in soft and muted colours and it just went like a dream. The only one I had trouble with was the flying geese, the birds in the air because the flannel kept stretching and moving, but that was the only trouble with it. JM: Right, can you tell me a little bit what flying geese are? MA: Well flying geese are triangles. Two triangles and a rectangle, and the triangles go either side of the rectangle, I can’t find the block now, and they look as though they are birds flying. JM: And when you say put together… stitched together… yeah. MA: Yes. Anyway, here we are, this, [Marj has now found the flying geese block on her quilt] that’s this sort of thing. So you have got supposedly the sky, the bird in the middle and the sky on either side of the two triangles… [JM: Right] and bigger triangles. JM: OK. So where did you collect the fabrics, the fabrics from? MA: As opposed to America where flannel is a brushed cotton fabric. MA: Yes. Because here we think of flannel as what miners wore, quite a rough material, whereas this is very soft. JM: Okay. Can you tell me a little bit more about the controversy of the story for people who don’t know the story of the underground railroads? 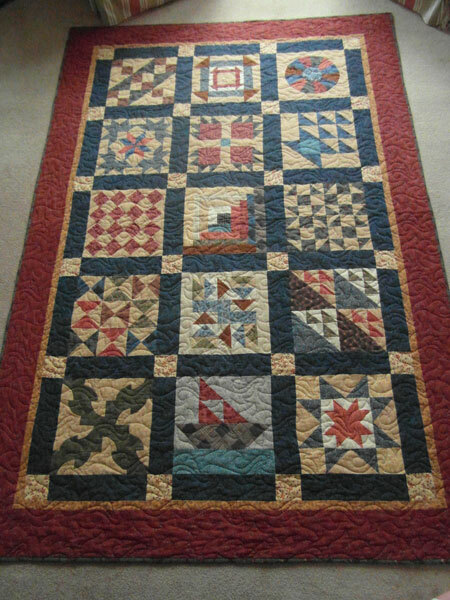 MA: Historically people don’t think that this particular quilt fits the historical background of the Civil war. They don’t believe that certain blocks were used to help the slaves escape to Canada. And there are historical quilters who have designed quilts that they say are more authentic than this particular quilt… but basically it tells the story of how the slaves escaped and how they were helped along the way by people, and the terminology appeared to be all railway terminology. I think there were controllers who led the groups that helped the slaves escape. And there was safe houses and it just appeared to be like a railroad, and escape route. So you have, one block is the Underground Railroad block [JM: Right]. Erm… this one is um… [short stop to gather thoughts] .. the first block is the underground railroad block, the second one is the Monkey Wrench block which signifies the tools that the slaves has to take with them… the next block is the Wagon Wheel block, which is going to aid the slave towards his journey to Canada. The next block is called Jesus the carpenter, and that follows a block called the Bears Trail… well, the Bears Foot the trail of the bear, and that goes through another block which signifies the woods. You then get a basket block and the slave is supposed to have filled his basket with berries and food supplies to go. And then you come to a block which signifies the crossroads and once you get to the crossroads you dig a log cabin, and there’s a Log Cabin block, in the ground for safety. The Shoe Fly block told the slaves to dress up in cotton and satin, with blow ties, so we have a Bow Tie block, because they had to look presentable or they would be noticed. Then they had to follow the Flying Geese and the Birds in the Air, those are two blocks, and stay on the Drunkard’s Path, which is signified by a Drunkard’s Path block. And then we have a sailboat block and they sail across the Great Lakes to Canada. And the last block signifies the North Star which will lead them there to safety. MA: But it’s a lovely way of remembering something like that… my own family, my father’s family came from Bristol and they worked hard with slaves in Bristol trying to look after them and get them jobs, work, and things like that. So it’s something that’s always been part of my background. [JM: Right]. So I, we thoroughly enjoyed our trip to America trying to find out these stories. And so this quilt just signifies everything like that. And gave pleasure to my husband at the same time. JM: Yes, Yes, [we both laugh] right, so plans for this quilt, it’s your quilt then and so for the home? MA: Yes, yes, not many quilts I keep. We have them on the bed and chairs and things, but most of the quilts go… I give away… because I find that there is always somebody who needs one. Perhaps somebody’s been widowed, somebody who’s not well, a new baby, but mainly I do them for elderly people or people who are widowed, or perhaps have terminal illnesses and just need a bit of comfort a bit of cosiness. JM: Okay. If we go on now, when did you first start making quilts? MA: I started 60’s, 70’s with hexagons… [JM: Right.] I think we all did. We all wore Laura Ashley dresses, so there was always plenty of fabric. I never finished it… it went up into the loft of the house and when we retired and moved to Porthcawl up in the loft we found lots of fabric… half a quilt. So I gave them away because I wasn’t going to do it again, and we retired and moved here and I discovered quilting again and wished I still had those fabrics because they were lovely. [JM: Yeah.] 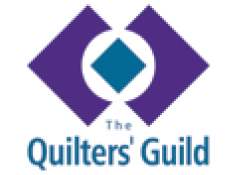 But I would not have quilted if I had stayed in Hampshire because my… the local quilting group there, I knew a lot of people from there and they were very high powered quilters, and very good quilters, and I think I would not have gone because I wouldn’t have thought I was good enough. They wouldn’t have made me feel intimidated, but I would have felt intimidated myself, until it was purely by accident when we came here I joined the U3A [University of the Third Age] and decided to do crafts and thought well I’ve done quilting, decoupage is no good because I’m very ham-fisted and the third craft was weaving and I decided I would do weaving. When I got to the group it was bright purple, bright lime and bright yellow florescent yarn, I don’t know what the yarn was and we were supposed to weave belts with this, well, no thank you, I couldn’t do that. And somebody came into the room with a bag full of quilts and the first thing she pulled out was a quillow, which is a quilt which folds into a pocket, and I could see my grandchildren with these quillows And that’s how I started. [JM: re-started?] Yes, restarted and then tried to look around for places to learn. It was suggested I went to a shop called Joseph’s Coat in Cowbridge and there I could learn to machine quilt which I had never done or even thought of doing… I swiftly discovered that my machine was no good at all [we both laugh]… and that was the start of it, and then I went to various groups, Port Talbot, Cowbridge, and learnt. JM: And learnt it. Okay, so what are your preferred styles of quilting, for quilting? MA: Um… um… so… and really… it depends what I’m doing. If I’m being challenged in a class and I’ve got to do it unless I get bolshy and refuse. If it’s left to my own, myself and I have to get it done quickly I do fairly simple quick patterns. JM: So how much time do you spend with your quilting? MA: Probably a bit of most days, either hand sewing in the evening or on the machine perhaps in the afternoon depending how busy life is but a couple of days a week I suppose I have, I try to quilt. JM: Where do you get your ideas from? MA: Umm… my ideas… I suppose through looking at magazines, books or people… um… I’m lucky in that all my children and grandchildren want quilts, and the grandchildren will tell me exactly what they want and they won’t accept anything that isn’t what they want… so that is good. One grandchild has chosen all the fabrics, she’s been through the house and chosen and she also wanted on it, she lives in England but she wanted on it a Welsh Dragon, and she also wanted ‘Anna is Epic’ [both laugh] [JM: Right.] so I’m in the process of putting ‘Anna is Epic’ on a quilt for an eleven year old. So… so really, you’re led into quite often what you make. If you go to a class then you’re more or less governed what you do. [JM: Yeah. ]But you are led into it by the person you’re making it for, the colours and the design. JM: Right. Can you tell me what you think about when you are actually making the quilts? MA: When I’m making quilts I suppose I’m thinking of who it’s going to go to. When we made quilts for the army going to Afghanistan we made quilts to send to the soldiers to keep them warm at night and I suppose each time you made one of those you thought about who it might go to. The very first one I did I was told it had gone to a wounded soldier called David at Headley Court and that’s all I knew. Next time I made a quilt for the army I was thinking now I wonder who will get this? What will happen to him? What will his life be like when he’s finished his stint in Afghanistan. I suppose you say a little prayer as well that they are going to be kept safe as you do it. [JM: Yeah.] Um… if it’s for relatives or for children well yes you think about them and you… will he like this? Will he not like that? Our next door neighbour a young man moved in and he’s more or less gutted his house and caused us a lot of discomfort by all the things he’s done, so I made him a quilt when the house was more or less finished and everything has to be just so with him, so I had to make sure I had nice colour greys with a bit of yellow in it because it couldn’t have anything too flamboyant. It wouldn’t have fitted in with his very precise lifestyle. [JM: Yes…] So you really just think about the person you are doing it for. 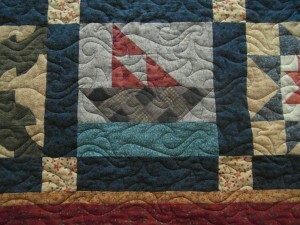 JM: Good, good, can I ask you why is quilt making important to you in your life? What does it give you? 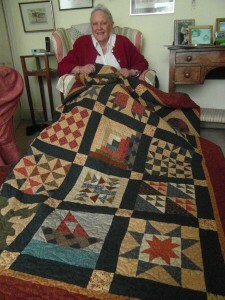 MA: But I can’t imagine now a life without quilting. JM: Sounds rather pathetic, but it has opened doors that I didn’t think I would have. 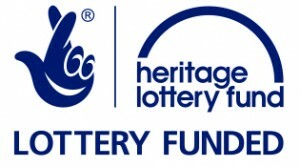 Very, very kind and helpful people and it’s good to be able to do things to help people. I’m not that much good at going into homes and nursing people, because I have no nursing experience, that sort of thing. But if you can make a quilt and you can raffle it and it can raise money for somebody, or you can send it to somebody, well then you are helping in a slightly different way, aren’t you? MA: I make quilts for the lifeboats to try and raise money for them. We no longer make them for the army because they don’t need them in Afghanistan. You just do what you can. JM: Right, going back now to the original quilt, the Underground Railroad Quilt, can you tell me what size the quilt is? MA: Cwtch being… made cosy, made safe because you’re warm and loving…. [JM: Right.] Yes, everything you want from a quilt. JM: Yes. Right, can I ask you finally, are there any other quilt makers in your family? MA: Well, not that I know of. I’ve got old quilts that have come from my husband’s house, but we don’t know anything about them, we don’t know who made them, or where they came from. [JM: Right.] So, and we use those, they are in the house on tables, but my mother always sewed, and I was always made to sew as a child. I think it kept me out of mischief, so I was settled down. I wasn’t brilliant, by any means, but my mother was good… but not for quilts and she didn’t keep any quilts in the house. Any of the old quilts went… I think she would have given them away, so there is nothing left from my mother’s side of the family at all. No, I don’t think she would ever have made a quilt. JM: No? Right okay, thank you very much Marj, is there anything else you’d like to add before the end. [MA: I don’t think so.] No? Happy? Yeah.